Bitcoin prices hit a low around mid-day, according to Mt. Gox, of $72.46 before rising to $76.48 as volume declined. The Bitcoin Foundation has announced that Jon Matonis will replace Peter Vessenes as the director of the Bitcoin Foundation, a move lauded by much of the commentators on the announcement. Meanwhile, new merchants continue to crop up daily, and two of the more notable services are Bitcoin.de and Kipochi. Bitcoin.de, a company marketing itself as a Bitcoin marketplace, has set up a Bitcoin exchange, in a fashion similar to localbitcoins.com, and will announce Wednesday the names of it banking partners. Meanwhile, Kipochi is bringing Bitcoin to Kenya via M-Pesa, which stands for mobile Pesa—the Pesa is Kenya’s official currency—and is estimated at 30% of the country’s GDP. The majority of these transactions are remittances from the Kenyan diaspora, though more than 70% of Kenya’s adult population uses Mpesa for a variety of small payments. 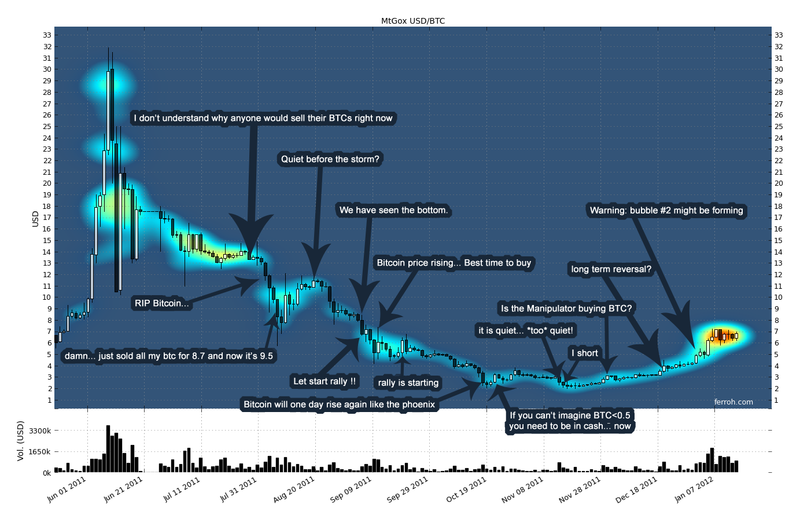 A top post currently on the Bitcoin reddit forum has found parallels with the trading psychology which appears to be driving recent price swings and that reflected in actual quotations from the BitcoinTalk forum in 2011. The chart from the thread is reproduced below, though the full sized version is available here.